I decided to get experimental recently and try making something that resembled Indian food. Even more adventurous, I tried to do so in my slow cooker, a machine that I'm not always comfortable improvising in. All in all, the risk paid off though, so I was pretty happy with the effort. I had three large sweet potatoes, so I wanted my curry (for lack of a better term) to be sweet-potato based. I turned my cooker on high and put some olive oil in the bottom with a large dollop of Smart Balance (you could use butter or more oil). To this I added a roughly chopped onion (big hunks) and about eight smashed but not chopped cloves of garlic. With slow cookers, it is important not to chop anything to finely due to the long cooking times. I added a little salt and pepper to the aromatics and let them sweat a little bit with the lid on. Meanwhile, I peeled my sweet potatoes and cut each one into large hunks. I also chopped some fresh shiitake mushrooms into hunks as well. I added them to the slow cooker, along with about a cup of vegetable stock and half a cup of skim milk. I also added a little more olive oil, a dash of cream, salt and pepper. I also added several teaspoons (or more) each of turmeric and cumin. Those were the Indian-esque spices I was going for. I would have liked to use whole spices for the sake of the slow cooking, but didn't have them, so ground spices had to do. Lastly, I added a handful of fresh whole cranberries to add some sweetness and tartness without the gratuity of sugar. At this point I was content with the flavor of the base and decided it was time to lid and leave the slow cooker. I left it for over four hours on high, or until the sweet potatoes were fork tender. I was waiting to see how much liquid was absorbed by this time to see if I was going to puree the curry or not. There was still too much liquid at this point, though the ingredients looked and tasted great, so I decided to puree the whole lot. I got my food processor and carefully (hot!) ladled in a few ladles at a time and pureed it all. The consistency was perfect, very similar in thickness to a curry from a restaurant. It wasn't quite as curry-flavored, but it was well spiced and definitely had a curry vibe. That's all I was really going for. 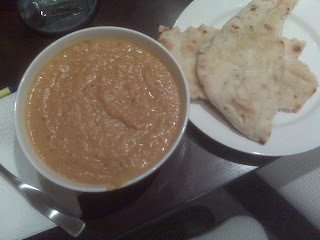 I served the curry with some toasted Fabulous Flats garlic naan bread, perfect for sopping up the flavorful, sweet potato goodness that my slow cooker managed to produce. I guess I helped a little too. I'll help it again soon if it pumps out something nearly as good as this again.